The following article is by Seah Chiang Nee, first published on The Star Online. The Government appears to be telling young Singaporeans that if they want debate, the government will give it to them and if the youngsters want parliamentary democracy, they can have it too – but not necessarily through elections or a two-party system. POLITICS is one of the things that have changed least in Singapore. Over a quarter of a century, the economy has been restructured, the demography has changed; new people have come and old trends have gone – pretty much of everything else, except perhaps politics. It seems to have remained relatively as it had been. For many elderly conservatives, that may not be a bad thing, since it also means stability and continuity. 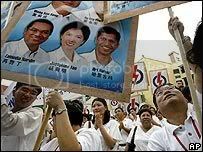 But faced with an uncertain world and a demanding new generation, the People’s Action Party (PAP) could be heading for a tougher time winning elections in future. As its founding leader, Minister Mentor Lee Kuan Yew once painted it: The next two elections should be no problem, but after that, anything goes. Now with the economic crisis affecting more families, the PAP has obviously been pondering how best to fight in order to stay in power. It’s a tough act as it strives to achieve a balance between rising – and contrasting – demands from various segments of society, from educated youths and disgruntled workers to poorer Singaporeans. For 50 years, the PAP has been winning elections to stand as one of the world’s few undefeated political parties, but with the help that power and incumbency has bestowed upon it. So what is its strategy to stay relevant? Prime Minister Lee Hsien Loong apparently wants to change the Constitution to have a Parliament with two components. The first is the normal 84 elected legislators who debate and pass laws and the second, a less significant, non-elected segment with watered-down rights to improve debate. This second force of 18 will comprise nine nominated MPs, chosen from a cross-section of non-partisan Singaporeans and up to nine non-constituency MPs (NCMPs) from the opposition camp. As an example, if the next election were to throw up only two opposition winners, then the best seven losers will qualify as NCMPs. In recent weeks, the pro-government press has been playing up the role of nominated MPs as well as the desirability of appointed Cabinet ministers. All these have one thing in common. They downplay the importance of opposition parties in Parliament or in Singapore’s political system. PAP party member Xu Kaixian wrote in Petir, the PAP organ, that democracy does not necessarily need the presence of opposition. “Currently, any deviation from Western-style democracy is denounced as authoritarian. But should that be the case?” the writer asked. Adding to this is a suggestion by PAP backbencher Hri Kumar Nair that Singapore consider appointing Cabinet ministers who are not MPs or may not even be members of the ruling party. The Government appears to be telling young Singaporeans: You want debate, we’ll give it to you; you want Parliamentary democracy, you can have it too – but not necessarily through elections or a two-party system. It apparently thinks it can satisfy their aspirations for greater debate and opposition in Parliament – without the PAP losing any seats. Lee Kuan Yew has always been wary about the potential dangers of one-man-one-vote system. Last year he warned that “a freak election” could wipe out Singapore’s success. This could happen if voters became bored and decided to give the vociferous opposition a chance out of ‘light-heartedness, fickleness or sheer madness’. “In five years, you can ruin this place and it’s very difficult to pick up the pieces,” he said. Last November, his PM son said that a “two-party model cannot work” in Singapore, and it is “much better off with one dominant party”. Since then he has stepped back a little by saying that “Singaporeans want national issues to be fully debated.. (so we should) improve our political system to encourage a wider range of views in Parliament, including opposition and non-government views”. Lee’s measures have generally been well received as a positive development. Critics, however, call it a sham reform that tries to manufacture a fake opposition, instead of freeing the environment to allow it to grow. “It is an attempt to tell Singaporeans that they could safely vote for the government without being deprived of an opposition voice,” an opposition member said. “The nature of Parliament should not be changed. It is after all a legislative body of representatives that should be freely elected by the people, not appointed, nor nominated,” he added. He said: “In my view, it is the duty of a responsible government to help evolve a political climate that encourages greater interest and participation from the people. On another occasion, Lee said: “Without the elected President and if there is a freak (election) result, within two or three years, the army would have to come in and stop it.” So far none of the younger political leaders has repeated this warning.